But of course many of these fundraisers can be easily incorporated or tweaked and used across the board. Don't forget we are always on the lookout for new ideas. If you know or have used a great fundraiser we would love to hear about it and add it to these pages. How great is that - your neat fundraising idea helping someone else raise money for good causes on the other side of the world! So here are all the best fundraisers just ready for you to give them a go! Whether its coconut shies, fortune telling or welly wanging, fetes and fairs are great fun and can be good money-makers. For many organisations putting on a good fete is very important. If you cannot organise your own fair it still might be possible to take a few simple ideas and use them at someone else's event. Often several local organisations will provide stalls, booths or attractions at a town fair or similar. Or fete ideas may be added to any other fundraiser you had going on. As well as this list of fundraising ideas this site also contains all sorts of other useful information for anyone working with schools, churches, sports groups, charities and other non-profit groups. The general information pages contain a lot of useful tips and hints for telling good stories and getting publicity. There are also useful tips about working with volunteers. New ideas are being added to this site all the time. Sign up to our RSS / Blog Feed to receive up to the minute details of all the great ways you can make money for your organisaton. Simply click the buttons on the left. 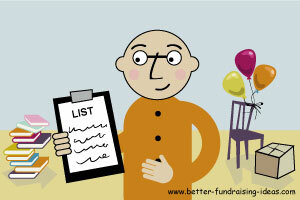 Could you add to this list of fundraising ideas? Working for a cause you believe in or a non-profit group you want to support is fulfilling and fun. Do not get stressed trying to find the latest, best, newest fundraiser. And certanly do not get browbeaten by the many fundraising companies trying to sell you products. Instead simply use your imagination and have fun!